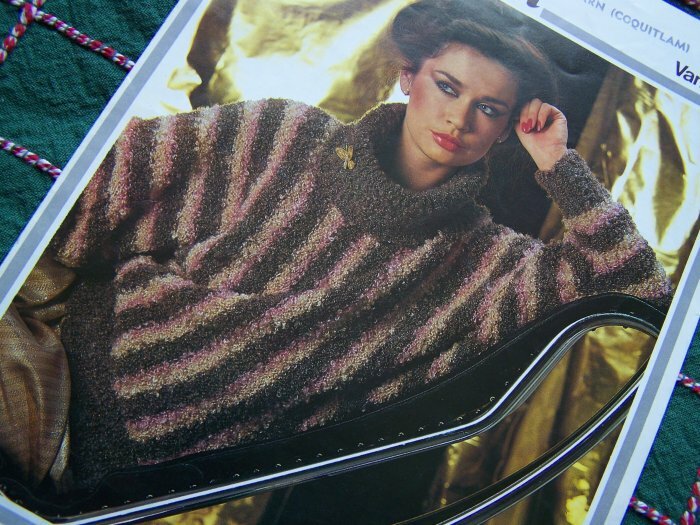 Vintage Hayfield knitting pattern for women, knit bulky cowl neck sweater pattern. Original pattern not a copy. Includes only the pattern not the completed item. 100's more listed. Inventory box 11. Pattern name: Hayfield cowl neck sweater Leaflet # 1704. ~~ Shelf/use wear, 2 page fold out pattern. Measurements: To fit bust 28 - 42". Actual size 31 - 43". Length approx 25". ** I have 100's of crochet and knitting patterns for women, misses, jrs, Men's, boys, girls, baby & infants, accessories and house and home. S & H to the USA is $1.50 mailed flat. I can fit quite a few of these patterns in a priority flat rate envelope for only $5.00 shipping. S & H to Canada $2.00 mailed folded. Ask about combined shipping. **Paypal payments: You don't need to be registered to send payment. I accept credit and debit cards, eChecks ( take a few days to clear), balance transfers. I also accept: Money orders, cashiers checks, personal checks ( with hold for clearance). Looking for a certain pattern? I have over 12,000 retro vintage sewing, knitting, crocheting, quilting, plastic canvas patterns in stock and I may just have it! I do combine shipping between both of my stores!